Parents – if you’ve ever considered enrolling your children in the martial arts for self defence, here’s a great example of exactly why you should! A would-be attacker was left battered, bruised and embarrassed after picking on the wrong person – a 14-year-old female martial artist. The schoolgirl was walking home alone through a park near her home when the 35-year-old man came up behind her and grabbed her arms. He soon realised his mistake when the young teen, who has studied martial arts for several years, broke free from his hold and started raining punches and kicks on him – despite being less than half his age. Sussex Police arrested the man – described as being ‘very thin’ and around 5ft 7ins – shortly after his attempted assault in Tilgate Park, Crawley and are appealing for any witnesses to the Saturday morning incident to come forward. ‘Although we have made an arrest, we need to speak to anyone who was in Tilgate Park on Saturday morning and saw what happened,’ said Detective Inspector Andy Bennett. If you’d like to learn more about our martial arts and self defence programmes for any age group, get in touch today and we’d invite you to try 30-days FREE membership as our guests so see the benefits for yourself. Pediatricians reason that a child secure in her ability to face the future, near-term and long-term, has the necessary foundation for high self-esteem. A child, teen, even an adult, that practices a martial art learns new skills. When they see their own progress, that powers belief in one’s own ability to handle new challenges. It starts in the family, but Pediatricians say kids need another group to belong to as well. Connecting with other people at school, church, or some organization where members share a common interest further shores up a sense that they belong. In martial arts, people of all ages connect over their shared goal of improving their health and well-being…and having fun while doing it. It’s easy to make friends this way, and looking around in class one sees it happening. Purpose channels energy in a meaningful direction. Most importantly, it’s got to be a direction and purpose that the child cares about, rather than one someone else forces upon them. When forced, we resent. And with no purpose, one becomes bored and aimless, which pediatricians claim can lead to trouble. Martial arts has a road of achievement built into it. A child or teen that starts down this path can see measurable targets to aim for in their progress. Each belt earned means one has been tested and measured by someone else, an experienced instructor. Martial arts creates a testing system that most kids want to take. That’s a sure sign of self-esteem, when one happily looks forward to another chance to test their progress. Who doesn’t want one more place in the world where we can hear the words, “Good job”? Instructors float through the class, watching student technique. Hard work pays off with these verbal pats on the back. It feels good to know someone’s judging you, and approving. A children need to trust their parents and themselves. Martial artists consider integrity as part of their black belt lifestyle. Students help each other in class, and that gives them more opportunities to trust, and to be trusted. responsible for setting a tone and culture of humility, respect, and positivity. Instructors have students aid in class instruction by demonstrating techniques in front of their peers. Contributing to class progress builds self-esteem. Allowing the child or teen to decide to stay with their martial arts training gives them practice to make other decisions about which direction to take their life. The American Academy of Pediatricians say this one is critical. The good news? Martial arts hits this one on the bullseye. The doctors argue that children need expectations, guidelines, and opportunities to test themselves. This is the foundation of martial arts classes. This comes from instructors and classmates. Lots of encouragement, coaching, and of course rewards ranging from the verbal, “Nice job” to the tangible, a new belt earned. Look, some aspects of martial arts can be difficult. And that’s a good thing. It makes the progress all the sweeter. But along the way, students stumble. And this also is good. It’s an opportunity to learn how to face challenge in the eye, and keep applying effort when something doesn’t come easy. Martial arts instructors pride themselves on corrective coaching until a student finally masters a technique. Last but not least, youth self-esteem begins within the family. Affection, pride, and the self-esteem of family members all impact a child’s self-esteem development. Imagine the momentum and lift a family would experience if multiple members all enjoyed the above benefits from martial arts. We guarantee there’s no catch! 30 days FREE membership as our guests, with absolutely no obligation to enrol. 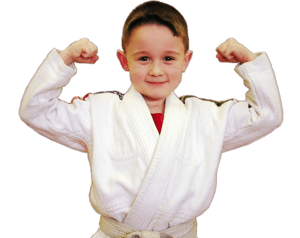 “Activities like tae kwon do, kung fu, and aikido are a fun way for both boys and girls to achieve fitness and focus. Some parents may think they also promote violence, but that’s a myth, according to experts. The martial arts actually help teach self-discipline and socialization skills. But, say experts, it’s the respect kids learn, whether from bowing or standing still and waiting for the next command, that can be the most important benefit: It often carries over into school, helping to improve behavior and even grades, according to recent research. “Six is usually a good age to start classes,” says Mimi Johnson, M.D., a member of the American Academy of Pediatrics’ Committee on Sports Medicine and Fitness. By that time a child should have enough muscle control to punch and turn properly and safely — essential to getting a real kick out of the martial art he chooses. Why not find out more for yourself and try 30-days FREE membership as our VIP guest! In a culture that seems to glorify violence in everything from music to video games and television shows, the idea of enrolling your child in martial arts training classes doesn’t always seem like a good one. While martial arts-centered action films seem to be filled to the brim with violent behavior and gory injuries, you may be surprised to learn that martial arts’ training is actually very beneficial to kids. Like so many other things that Hollywood doesn’t always get right, martial arts isn’t quite the brutal, vicious pastime that it seems! In fact, these are 10 of the reasons why you may want to consider martial arts training for your kids. If you’re still concerned about encouraging violent tendencies or teaching your child to fight, it may be helpful to visit a school in your area. Speak with the instructors, administrators and other parents to get an idea of how things operate, and hold off on forming a negative opinion of the martial arts until you’ve done a bit of exploratory research. You may even find that training is the perfect activity for your entire family to do together!